Well, what a week that was! We are still recovering from our biggest and best Catch the Bus Week yet. Our fourth annual celebration of the bus, Catch the Bus week (#CTBW), saw support for the bus across the length and breadth of our country. Passenger groups, bus companies, local authorities, passengers and Members of Parliament, all stepped up and showed their support for #CTBW. All across the country groups and individuals joined together to celebrate the bus and encourage people to get out of their cars and to hop onto a bus. We were thrilled that this year’s #CTBW had the support of almost 300 different stakeholders. People seized the chance to promote the benefits of the bus using social media, special events, competitions, giveaways, educational programmes and charity partnerships. We don’t have enough space here to tell you about all the brilliant activities taking place last week. We will publish a full round up report soon, in the meantime here is just a glimpse of some of the highlights from Catch the Bus Week 2016! Just like last year, #CTBW received Government backing with the Department for Transport reminding people about the importance of #CTBW and urging them to plan their bus journeys online to make transport safer and easier. On Wednesday the Bus Minister himself, Andrew Jones MP, showed his support for #CTBW by visiting Brixton bus depot and trying his hand at driving one of the new London Routemaster buses. 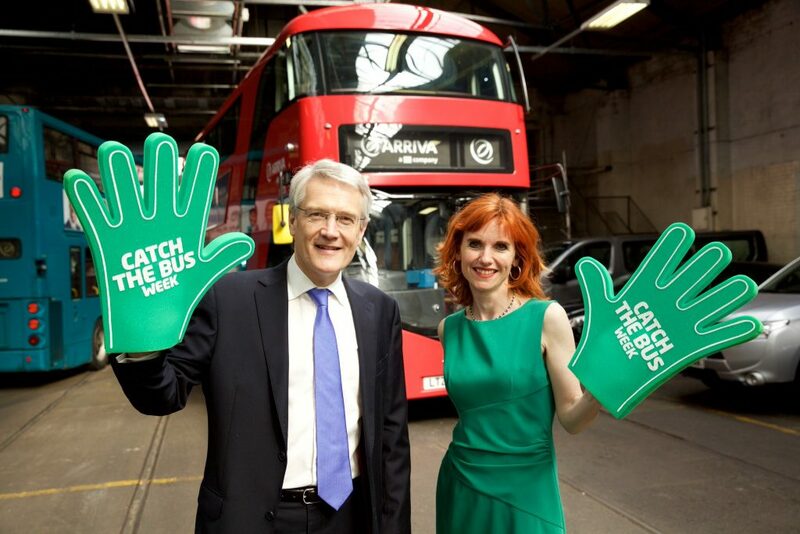 We had a myriad of other MPs waving their green #CTBW hands on social media throughout the week and encouraging their constituents to choose the bus. We even had the new Shadow Secretary of State for Transport Andy McDonald MP showing his support and Michael Dugher MP, a former Shadow Secretary of State for Transport, wrote a piece for his local paper about #CTBW and the importance of the bus to Barnsley. We had strong backing from bus companies, local government and transport authorities all across the country. Many ran competitions and freebies with Arriva organising local offers, Stagecoach Bus offering Amazon vouchers and other goodies, and the Go-Ahead group organising special events and ticket giveaways to promote #CTBW in collaboration with local radio stations, local councils and shopping centres. First Group Manchester, York and South Yorks spent the week reminding their passengers about the importance of catching the bus by tweeting daily fun facts and stats about bus safety. National Express West Midlands celebrated on the High Street in Birmingham. McGill’s buses, Scotland’s largest independent bus operator, offered a chance to win a week’s free travel and Trentbarton ran a “Green hair, no fare!” scheme with their drivers wearing green wigs! Find a driver with a green wig and customers would get a free ride! In Liverpool, Merseytravel used #CTBW to highlight the effect of congestion on the UK economy and offered £500 worth of prizes at their Williamson Square event. Meanwhile across the West Midlands, Network West Midlands and Transport for the West Midlands ran a very successful #busselfie competition encouraging passengers and employees to take a snap of themselves on the bus. Just like last year we saw a groundswell of grassroots support for catching the bus from passengers and campaign groups. The NHS in Glasgow made sure their very own Kami Bear promoted #CTBW working with Glasgow Children’s Hospital Charity to encourage children and their families to get on the bus. Travel Smart awarded certificates to students who caught the bus to school and YourBus offered the chance to win discounts on your bus tickets. Bus Users UK members were involved with #CTBW running ‘your bus matters’ events up and down the country. We were really blown away by the support for this year’s #CTBW. Thank you again to everyone who got involved, you and your hard work make Catch the Bus Week the success that it has become. While Catch the Bus Week is only one week each year it serves to highlight the importance of catching the bus – it is great for your health, boosts your local economy and is great for the environment. So, until next year, keep catching the bus!